I’m determined we’ll launch our homemade photo greeting card business this year, so I’ve been surfing through our photo-storage flash drives for favorite images. 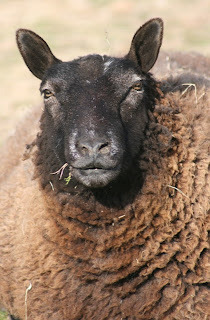 I find that one highly captionable face stands out among my sheep photos: It’s Ursula’s. Ursula is a Classic/Miniature Cheviot ewe officially known as Misty Glyn Little Bear. Born on April Fool’s Day in 2006, she belongs to my friend Lori Olson. Lori couldn’t take her sheep when she relocated from her Missouri farm to small-town Wisconsin, so they’re living with us until she can keep them again. Ursula’s father was our first ram, Wolf Moon Abram, and old Baasha’s lovely, lookalike daughter Wolf Moon Macha, a.k.a. Baannie. 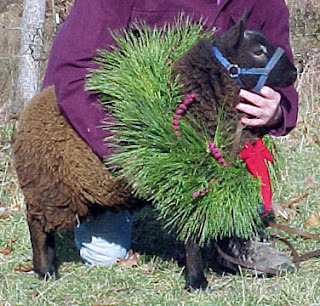 Lori wanted to raise a bottle lamb, so when Baannie presented us with twins, Ursula became Lori’s new baby. So she’d get her meals on schedule, Ursula went to work with Lori. As she grew, she quickly came to believe she was at least part human. She accompanied Lori and her husband, Mark, to town in the truck; slept on the porch swing; noshed on Tostitos and blue-ice push-ups; and even rode shotgun in the cab of the tractor with Mark when he worked the fields. Lori later added a ram lamb, Misty Glyn Gwyn ap Nuad, a.k.a. Wooby, to the mix. Together Wooby and Ursula made lambs. Then, when Lori and Mark moved north, the sheep moved south and resettled in as part of our small flock. I felt bad for Ursula. She was used to being a woolly human instead of a sheep. But I needn’t have worried; she’s still her quirky, more-than-sheepy self. She’s given us lambs, and despite her less than standard sheep beginnings, she’s a devoted mom. She’s taking a year off in 2011 but has given us two singles (both ram lambs) and a set of lovely twin ewe lambs. 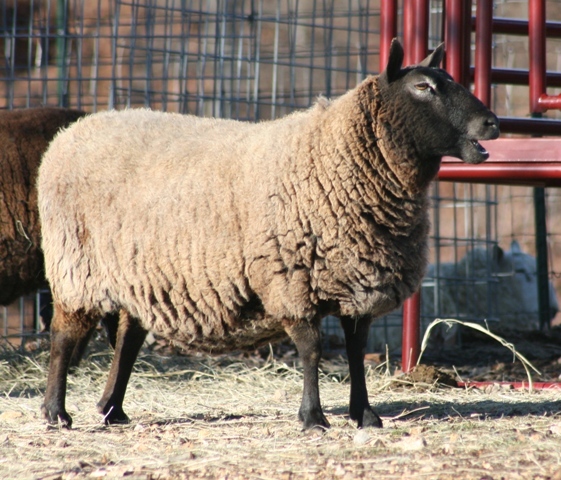 I blogged about the arrival of Ursula’s 2010 ram lamb, Misty Glyn Aries, and am glad to say he’s a chip off the old block. I was already tempted to keep him as a future breeding ram for his wee size and distinctive facial markings, but his Ursula-like personality cinches it: He’s staying! So I’ve decided to share some of my favorite pictures of Ursula, ones that I’ll probably use on cards. Can you help me with captions? If you can, fire away! Sue Weaver sold her first freelance article in 1969. Since then her work has appeared in major horse periodicals, including The Western Horseman, Horse Illustrated, Chronicle of the Horse, Flying Changes, Horseman’s Market, Arabian Horse Times, The Appaloosa News, The Quarter Horse Journal, Horse’N Around, and The Brayer. She has written, among other books, Storey’s Guide to Raising Miniature Livestock, The Donkey Companion, and The Backyard Goat to be published in 2011. Sue is based in the southern Ozark Mountains in Arkansas. I just love sheep...I'm so jealous! The pictures are adorable! Sue, I just love this blog. And I'm so pleased you'll be doing a greeting card business--what a great idea with so many cool animal photos. I think the caption for one of the last two photos should be "Go ahead, make my day!" That is one angry-looking ewe! :) Good luck and shoot me an email sometime!